This should be a happy moment for Barnabas — his enemies ground to powder, with practically no effort on his part — but he just looks worn out. Technically, this storyline ended in September, when Quentin didn’t die, and therefore didn’t come back to haunt the 1960s family after all. But here we are at half past November, and what do we have to show for it? Quentin’s magic portrait has been lost, probably destroyed in the fire, which means his lycanthropy might flare up again. Edward’s fiancee has been stolen out from under his very mustache. Judith has prematurely entombed her faithless husband. Angelique has lost her wager with the Devil, and is probably en route to the fiery pit. Carl is dead. Jenny is dead. Laura is dead. Sandor is dead. Beth is dead. Even Istvan is dead. Nothing but widows and orphans, as far as the eye can see. This is what happens when you let Barnabas Collins drive. 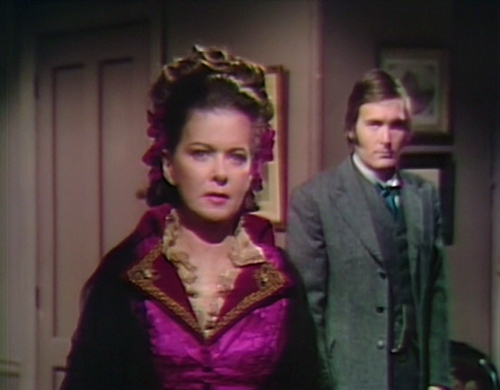 So let’s begin today’s parade of ruined lives with our first widow, Mrs. Curry. This is a scene from last week, but it’s relevant for our purposes today. Tim’s been checking up on Reverend Trask, and now he’s reporting his findings to Trask’s wife, Judith. Tim: There was a widow in Fall River — respectable, a Mrs. Curry. Her husband had been dead for several years. He was a minister. Judith: Gregory had been seeing her, when he was supposed to visit me at the sanitarium? Tim: He told Mrs. Curry that Minerva had passed on; he neglected to tell her that he married you. Mrs. Curry expected to marry him. Tim: I never saw Mrs. Curry. She’s dead. She killed herself, when she discovered the truth. So, imagine that — a woman committing suicide, because she finds out that Gregory Trask is off the market. It hardly seems likely, does it? And it’s hard to imagine what Trask was up to, exactly. Why was he seducing respectable people in Fall River? He’d already married an extremely wealthy woman, and packed her off to a sanitarium. What use does he have for another minister’s wife? It reminds me of that old lady in Providence, and the other one in Boston, who I’ve been mulling over in my off hours. If you don’t happen to be au fait with my personal crackpot conspiracy theories, then you should read Dark Shadows’ Agents of THEY, a previous monograph on the subject of They, the dark and shadowy organization that’s been manipulating events from behind the scenes. Trask was wooing that old lady in Providence, and the other one in Boston — going to the theater, and eating at fancy restaurants — and I have long suspected that they, somehow, were mixed up with They. And now there’s another widow, in another New England town. Tim drops this truth bomb on Judith, like it’s totally obvious what Trask was up to with Mrs. Curry. But how many widows do you actually need, in your social circle? Speaking of which, here’s another troubled widow making poor life choices. Kitty Soames — relic of the late Gerald, Lord Hampshire — arrived at Collinwood two months ago, determined to wangle herself a proposal of marriage from Edward Collins. That wangling has borne fruit, but she’s also come to realize that she’s actually an oil painting from the late 18th century, a condition that’s increasingly common in these troubled times. Unwilling to burden her betrothed with a lengthy art restoration project, Kitty has decided it would be best to skip town while she’s still three dimensional. This dashes Edward’s dreams of marrying Kitty, and hearing the pitter patter of tiny brushtrokes. Maybe he should develop an interest in marble statuary; they’re cold, but at least they don’t run out on you, not without a hand truck and several accomplices. Meanwhile, heartthrob widower Quentin Collins has made it to New York City, to explain to his girlfriend that he has to say goodbye. She’s an oil painting, too, by the way; it’s like an epidemic. “Why is it so important?” says Amanda, who didn’t realize she was competing in an art exhibition. I’m not sure how he’s planning on doing that, considering the last known location of the portrait is his bedroom, which is now closed to visitors. The current and final occupant of Quentin’s suite is Reverend Trask, the hottest ticket in Fall River. Judith has decided to rid herself of this turbulent priest by trapping him in the west wing, and prank-calling him all night. She’s going to let him starve to death in there, unless she can organize something worse, and she’s set up a dedicated phone line so she can call him up and enjoy his suffering. She’s even hidden the portrait of Amanda in the room, just to twist the knife at the proper psychological moment. So it turns out that Judith Collins is amazing at this. She never seemed to be particularly good at anything, except sucking up to her grandmother, and giving people looks. You’d imagine that among her brothers, she would be the least likely to excel at this kind of thing. Quentin’s the crafty one, Edward has the business and organizational skills, and Carl was the one who loved pranks. But here’s Judith, assembling an uncrackable locked-room mystery, and getting away with it. Where did this come from? Well, let’s listen in on one of her Jerky Boys routines. Trask: Judith, for God’s sake! Judith: Are you enjoying your retreat, Gregory? Trask: Judith — you must let me out! Judith: How familiar that sounds! I used to say it every day at the sanitarium… but they wouldn’t listen to me. You arranged that. So now I don’t have to listen to you, do I, Gregory? I mean, think about it: Judith was in the sanitarium for four months, even though there was absolutely nothing wrong with her. She came home unexpectedly — released with no notice, under cover of darkness — and she was a changed woman. This is a Judith that knows her own mind — a Judith that changes her will, and hires private detectives, and organizes secret carpentry projects without anyone noticing. Who is this new Judith, and what’s responsible for the change? What really happened at Rushmore Sanitarium? We may never know the details, but Judith is awfully concerned about the love lives of widows all of a sudden. Has she been talking to that old lady in Providence, and the other one in Boston? If they wouldn’t listen to her… did she start listening to They? But Josette just sits there on the wall, with her unbelievable poker face, and emits music box melodies. “It is Kitty Soames you must forget!” the portrait says, because it is evil. 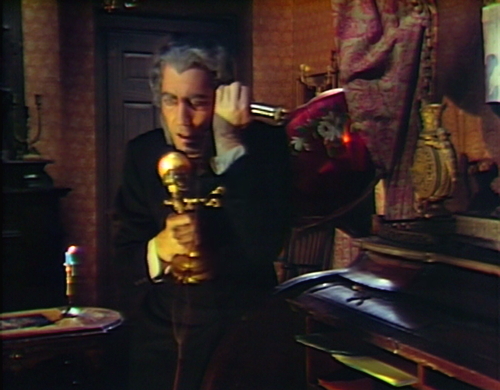 When Barnabas arrives to collect whatever’s left over, Kitty is still trying to hold her shattered storyline together, as the shards of 1897 shimmer, and disappear. She likes it here — in this amazing, unpredictable, irresistible year — and she doesn’t want to get hoovered up into another arbitrary time jump. Kitty wants to stay, with Judith and Magda and Pansy — the exceptional widows and orphans, who stood up to the tempest and managed to survive. And that clinches the argument, somehow. 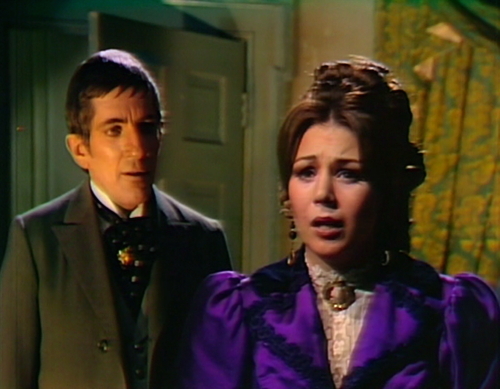 So Kitty Soames dons somebody else’s wedding dress, and detaches from this remarkable period in Dark Shadows history. Untethered, she drifts away, leading us even more back into the past. This is her destiny — and ours, somehow. Tomorrow: Not in Canvas Anymore. At the start of the teaser, you can see a stage light above the set. When Tate enters the burned studio, the boom mic hovers overhead. 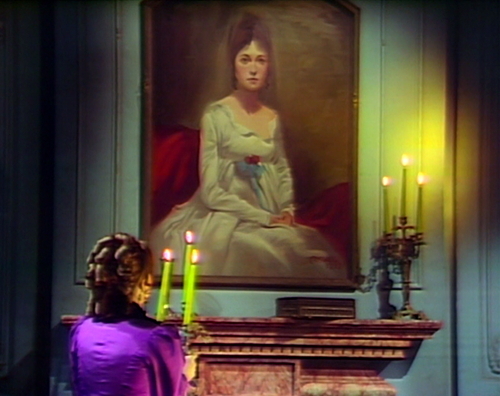 After Tate tells Barnabas that the portrait was in the studio, you can hear the doors of the studio open and close. When Kitty demands that he let her go, Barnabas babbles, “To go among strangers? In the final scene, when there’s a closeup on Kitty, you can see a little bit of the Chromakey blue screen behind her. Imagine all those things Judith must have done in her dark dreams! How many times she poisoned Edith, or plunged a knife into Edward, smothered that irritating Carl, pushed Quentin from the cliff at Widows Hill. And now, she’s finally done something FOR REAL! That rush of power, the thrill of holding all the cards! She’s waited all her life for it. Is this Fall River, Massachusetts they’re talking about? 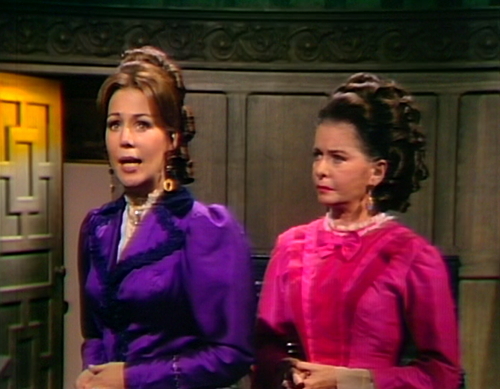 If so, it sounds like Dark Shadows’ little nod to the Lizzie Borden story. My favorite period of DS, IS ending, and now when you mention Carl, Sandor, Jenny and Laura, I am shocked to remember I have forgotten about them. This storyline went on forever! Judith is AMAZING with her new found evilness, again another satisfying ending for a Trask. 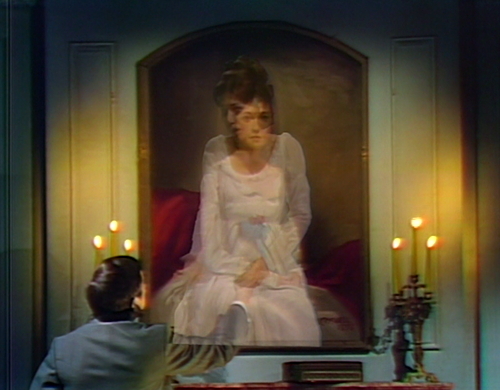 Kitty and Barnabas disappearing into the portrait was magical AND satisfying, Quentin and Amanda, not so much. Loving most of the wrap up, dreading the next few months…. Now that 1897 is drawing to a close (in a maze of drawings), one might recall that Edward during this period discovered something he had been clamoring for in the beginning: the “secret”. Now that he knows it, it’s his duty to maintain the Collins family tradition and hand it down, first to Jamison (I almost spelled this, yet again, with an “e”) and then to Roger — or, actually, perhaps Liz as the one who took over to maintain the family business and control of Collinwood would have been handed the secret. This means that Liz would have seen through Barnabas’ fabricated story from the very moment he first showed his undead face at Collinwood in April 1967, which also means, like the Outer Limits episode The Man Who Was Never Born, Dark Shadows as we have known it up to 1969 has suddenly ceased to exist, with the show probably ending in mid-1967 just as Art Wallace had first envisioned it, with Roger going over the edge of the cliff at Widows’ Hill in the midst of confronting Vicki over her supposed collusion with Burke Devlin to expose his guilt in the manslaughter case that sent Devlin to prison more than 10 years ago. The other story during this time would have been Jason McGuire (originally Walt Cummings in Art Wallace’s story bible) — so, perhaps, he would have gone over the edge of the cliff instead, after Carolyn confronts Jason about his blackmailing activities and to stop him from marrying her mother. Great observation! Liz would have known about barnabas! Or should have, but didn’t even know Paul Stoddard wasn’t buried in her basement, so… Idk, she forgot? The “secret” was ended by Pansy Faye, the wooden stake, and the doppelganger of Barnabas. 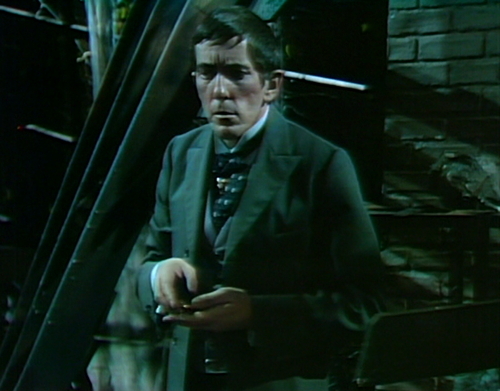 This other “new” Barnabas is human, not a vampire trapped in a secret room waiting to get out. The secret is over. “The Man Who Was Never Born” is my favorite episode of THE OUTER LIMITS!!! I think I’ll watch it tonight. Actually he does learn the secret and does not simultaneously. Hear me out. Edward learns that Barnabas is a vampire, which is the family secret. However, he does not figure out that Barnabas actually IS the secret, Because of this, the secret is no longer passed down through the generations, which means that Elizabeth and Roger never learn about Barnabas. The idea that the secret is passed from Edward to Jamison to Liz/Roger assumes that nothing terrible happens to Edward and/or Jamison while we’re not looking. Orally passing down a secret from one person to the next just before you die is not an award-winning idea. The system has a single point of failure. This is especially true given [spoiler re: Edith]. Also, as per Barnabas’ shenanigans with the family history book in ep 797, the time travel to 1897 happened after he’d arrived at Collinwood, so therefore mumble mumble necrobabble. I am looking forward to your fractured take on the torment of the next few months of story…. But how many widows do you actually need, in your social circle? In many times and places, widows were considered the only women who had the freedom to be sexually available. Unmarried women wouldn’t risk losing their honor (or whatever the kids are calling it these days), and unless you’re the Prince of Wales it’s generally no fun dealing with your mistresses’ husbands. There are other reasons besides money Trask might want to keep a few spare widows in his pocket. This attraction to oil paintings includes Roger, who fell in love with Cassandra by way of the portrait of Angelique. It’s in the Collins blood. Just curious, is anyone besides me going to the 50th anniversary festival this weekend? 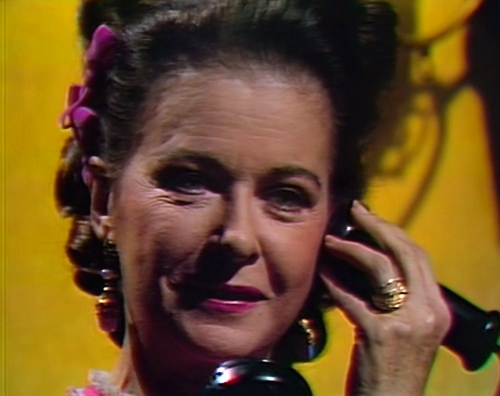 The Jerky Boys reference captioning a photo of Joan Bennett cracked me up for a full five minutes. Thanks Danny. Pansy has survived in spirit but not otherwise. 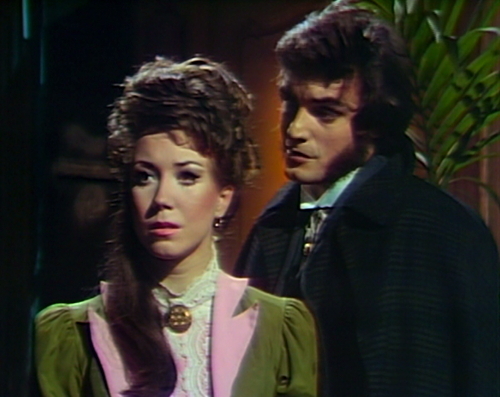 I admit to not being happy about Barnabas leaving 1897 so abruptly. I realize the storyline had worn out its welcome, but I did not like the way it was resolved. Wait! What? But going back to 1795 (or 1796 or 1797 – the last date scrawled on the lower right of the painting)? For a day trip? For a weird new storyline? Tell me again why we were anxious to leave 1897?